Dobbin Atlantic Scholar’s photo from Nova Scotia a competition winner! Photo © Dr Laura Devaney, Dobbin Atlantic Scholar. Dr Laura Devaney, 2016 Dobbin Atlantic Scholar, entered, as part of the ‘International’ category in the Teagasc Vision of Research and Innovation image competition, a photograph she had taken during her research visit to Dalhousie University as part of her scholarship. It has been selected as one of the winners for 2017 and selected images will be used to promote Teagasc research and are featured in their 2018 calendar, which is circulated nationwide. 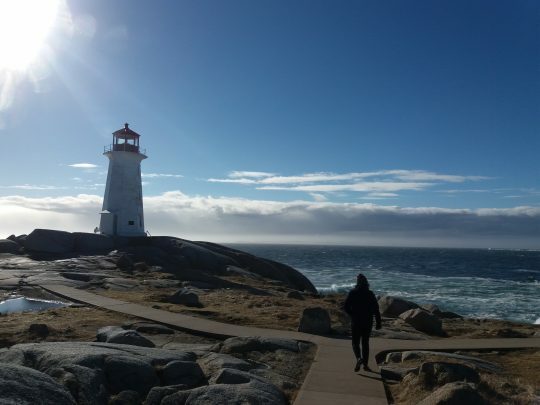 The winning image (see above) was entitled “Our (Shared) Ocean Wealth” and was a stunning photo of Peggy’s Cove in Nova Scotia that she visited on her second weekend there. Further information is featured here in the Teagasc Winter 2017 edition of TResearch. Laura also wrote a short piece on her experience in Canada on the Dobbin Atlantic scholarship in TResearch and this is on page 4 here.